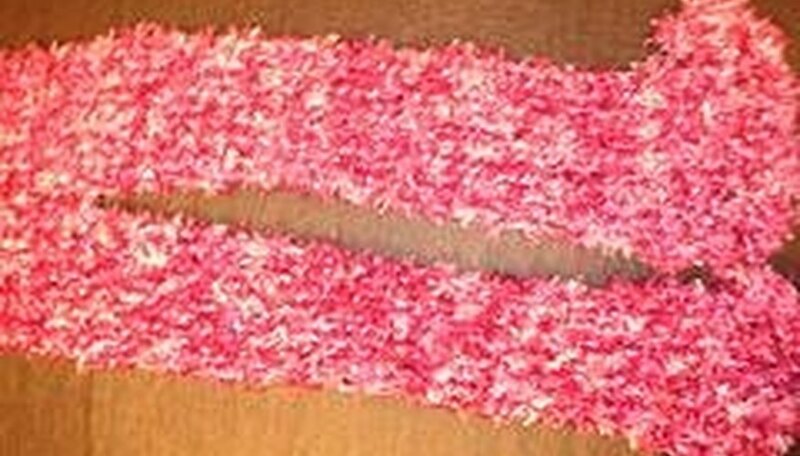 With just basic knitting skills you can make a fluffy scarf, but you won't be able to make just one. Your creativity will run wild with the different combinations of yarn that you can put together. But beware -- every one of your friends and family members will want you to make them one after they see yours. Instead, offer them these instructions and teach them some knitting skills if needed. You'll be surprised at how fast and easy it is to do, and pleased at how expensive this scarf looks when you are finished. Gather your supplies. You will be purchasing three separate types of yarn for this project. The first will be a tweed or multicolor yarn. The other two will be solid color yarns that match the first yarn. Make sure each yarn has a different texture (one very fluffy) for best results. You will also need a pair of straight number 15 knitting needles. Cast on, using strands from all three yarns. The number of stitches you cast on depends on the width you want the scarf to be. It can be very thin and decorative or very wide to be used as both a head and neck covering. Just remember that the finished scarf width will be a bit more than what first appears with the cast-on row. Knit every row using the basic knit-stitch until you have reached the length of scarf you prefer. Bind off the last row. Cut the three yarns and pull them through the last loop on your knitting needle. Weave the yarn ends into the bind-off row. You may use larger knitting needles if you wish to use additional strands of yarn or want a looser stitch. A fringe can be added to your scarf using strands from all three different yarns.